I rushed through spinning the wool and silk batts for sock yarn, but before I could take a few snaps to share, we went through this really dark period where SE Minnesota had absolutely NO DIRECT SUNLIGHT for several weeks. The perpetual darkness was kind of awful, actually – I think I heard on the radio that it was some kind of weather record for the area. But today! Today I woke up to blue skies! I’m here, unwashed and uncombed, to take photos before this fleeting good weather vanishes. 🙂 Aren’t you glad the internets don’t carry smellovision? I present to you the first prototype of my “perfect” sock yarn! The yarn was spun using mostly short-draw style (worsted spinning). The batts had been prepared to maintain the parallel prep as much as possible (I was applying fiber directly to the large drum), and I used my forward hand to smooth down the single as it drafted to lock the fibers in place. This technique makes an exceedingly smooth and shiny yarn. 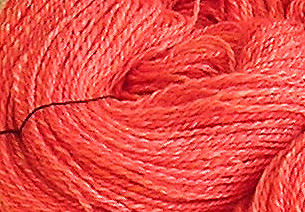 I could see where the blending was not too thorough – I believe the photo shows where there are shiny paler parts (silk) and darker fuzzy parts (wool). But overall, I think the yarn will still wear pretty well. I was aiming for standard sock yarn weight. I used a strand of Meilenweit sock yarn as an example, the same stuff I used for Annalisa’s socks. I sampled to make a 2-ply yarn that would have approximately the same final grist, and I spun mostly to the standard for the entire lot. The final outcome: Meilenweit sock yarn – 100 g, 430 yards; Twosheep sock yarn – 110 g, 424 yards. Hey, that’s not bad! 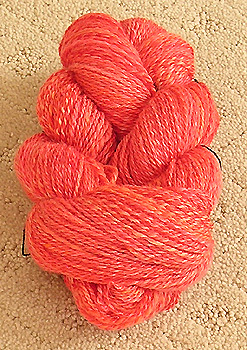 Most handspun is usually much denser than millspun, and while I did come out a little shorter for greater weight, the difference is pretty small. (I’m rather chuffed about it!) Goofing around with calculations – this is nearly a half mile of singles. Cool. How inspiring – it looks terrific. Can’t wait to see how it knits up! Lovely!!! Ah, the joys of technical spinning. Looks as if your grist and twist are fabulously consistent. Hurrah!!! Looks like sock yarn to me. Have you swatched it at all to test it’s sock suitability or are you going on theory? That’s a breathtaking color and I’m not one for the orange/corals. You’re spinning what I’m working toward: sockweight. I’m almost there. Also use a worsted draw and I find that suits my needs most of the time. Ohhhhhhhhh, Ahhhhhhhhhh, must go spin. Thanks for the motivation. I’d say there is no difference! Most millspun yarn comes up short these days;-( It looks amazing! A ton of work went into that skein of yarn and it is lovely! Such a cheery color! Nice. Smell-o-vision…you crack me up. It’s beautiful yarn. Hopefully it wears as well as you think it will. Wow . . . this is gorgeous! I’ll have to see if I can come close to your specifications sometime. i know how you feel – my parents live in eagle bend (between sauk center & alexandria) and there was absolutely no sunshine for the entire 12 days i was home! oh and p.s. the yarn is quite lovely! I’m glad you waited for the sunshine to take those pictures — the yarn looks spectacular! Looks wonderful, let us know how it knits up!